For the last forty years, the world has been aware about a possible planetary climate change induced by Carbon Dioxide emissions from fuel fossil burning. In fact, the IPCC, a United Nation’s organization, states that they are 99% sure that the human being is the major responsible for the rising global temperatures since the beginning of the Industrial Revolution (Stocker et all, 2013, p 5-7). However, many people have a different opinion about this issue. This group, that includes people from different occupations like climatologists, physicians, and geographers, are known as “skeptics”, since they partially or totally disagree with this theory. Many of them states that there is no conclusive evidence about the climate change, while others don’t agree that the rising CO2 concentration is capable to alter the world climate. The purpose of this paper is to analyze the skeptics’ claims about climate change in order to understand why they are so skeptical about a well-documented and peer-revised topic like climate change. Some issues pointed by the skeptics are improper methodology, excessive reliance on computer models, misinterpretation of historic climatic register, and biased science. Is Global temperatures really rising? The first question that comes in mind is: what the term average global temperature means? It is possible to have a single representative temperature for the entire planet? That is the first point cast in doubt for many skeptics, since this number can vary according to the adopted methodology. To obtain this number, meteorologists and climatologists rely on temperature information provided by hundreds of meteorological stations spread around the world. Those stations are where the problem begins. Some critics argue that temperatures near cities are higher than that measured in the country or in the forests. This difference is attributed to the urban heat island effect, a warming effect caused by buildings, cars, industry, asphalt, reduced vegetation areas, etc., that changes the air circulation patterns, albedo, air humidity, and several other factors, causing a difference of temperature between city and the country that can reach 12ºC (Akasofu, 2010). Therefore, if a meteorological station is located in an urban area, its temperature measures are subject to the same trend. Another point that concerns the Skeptics is that several rural meteorological stations have been closed in the last years. They also claim the existence of a strong correlation between rising temperatures and the reduction of those rural stations (D’Aleo, 2002). Therefore, the current rising temperatures would be just a consequence of the way data is collected. Skeptics have been complaining that temperature data in the United States is not completely available for pair reviewing, making more difficult to verify the quality of the data involved in climatic modeling (Global Climate Change Facts, n.d.). Figure 1. This graphic shows the correlation between the number of meteorological stations (blue dots) and the average temperature (purple bars). 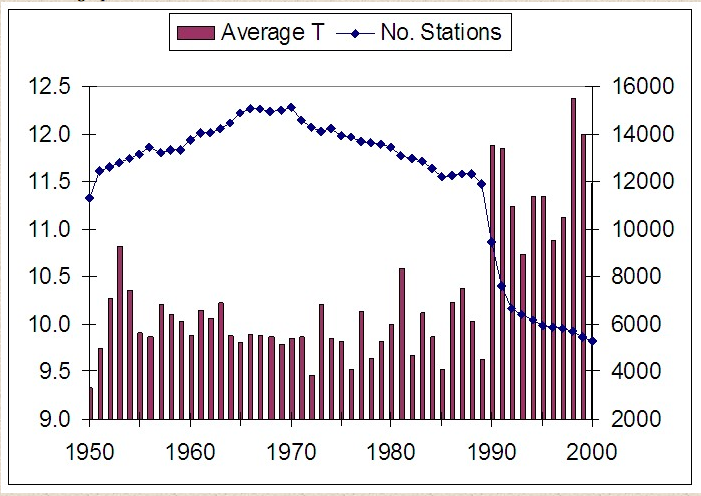 The rising temperatures in 1990 coincide with the closing of several stations – most of them in rural areas - around the world (Global climate change facts, nd). Why different models show different results? The main tool used by climatologists to predict climate tendencies is computer modeling. Those models are very useful for weather forecasts, providing reliable three to four days’ prognostics. Nevertheless, when the same models are used to climatic forecasts, which involves larger periods, the results diverge among them. The model forecasts also diverge from observed stable temperature trend in the last years, so the skeptics state that the models are unable to provide accurate climatic forecasts. Figure 2. An interpretation of changes in global average temperature from 1800 to 2012. The temperature in the vertical axis is for reference scale. An insert above the yellow box is a detailed version of data shown in the yellow (Akasofu, 2010). Another point made by the skeptics is that all models compare current temperatures with the period between 1860 and 1920. However, 1860 is considered the end of a period called “the little ice age”. According to Akasofu (2010), the Earth is still recovering from this cold period, one of the coolest in the last 8000 years, while the computer models use to predict global temperature trend rely only in a short period beginning in the 1970s. 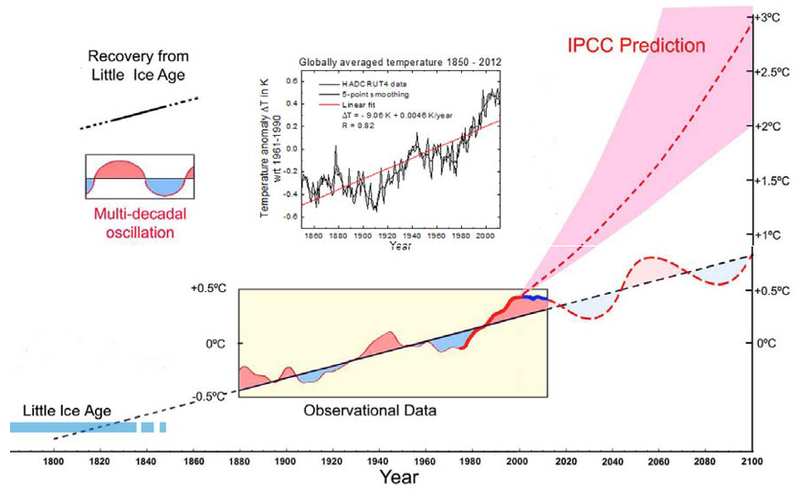 This choice of data and its linearization suggests a more accelerated warming trend than that we can get from the linearization of the entire period since 1860, as we can observe in figure 2. Nowadays, we are in the cooling period of the Pacific Multi-decadal Oscillation, which enhance the difference between measured temperatures and computer models results. Therefore, any observed warming trend is probably part of this recovering process, instead of an effect of the anthropogenic activities. Who benefits from global warming? Global warming is a biased topic, not only academically speaking yet also economically and politically. Some skeptics see a hidden agenda behind “global warmers” – people that advocate the global warming - position. Assumed skeptical researchers face difficulties in obtaining research funds, and the media have been giving more space to warmers than to skeptics. Warmers usually accuse skeptics of being financed by the oil industry, while skeptics state that warmers work against the developing countries, since the restrictions of fossil fuel could jeopardize its development. Companies that make money from carbon credit earn billions of dollars by implementing “mitigation actions”(Global Climate Change Facts, n.d.). Surprisingly, most of those action are not focused on reducing fossil fuel consumption or planting trees yet on building preposterous CO2 absorbing machines, “cultivating” algae by launching iron oxide in the ocean, trading questionable carbon credits, or even launching orbital mirrors in order to reduce sun’s incidence. Those questionable strategies are amazingly expensive and can be a heavy burden to the taxpayers. As we could see, bad data quality, confuse methodology, improper computer models interpretation, improper climatic history interpretation, and biasing are widespread in climate change theory and among its defenders. This questionable scientific behavior may be causing us to miss something important. Our incapacity of properly understand what is really happening with the global climate can put all humanity in danger. What if the climate is cooling instead of warming? Will we be prepared? What if while trying to prevent a catastrophic global warming we are causing a catastrophic global cooling? In order to really understand our planet, science must be skeptic and unbiased. The search for elegant scientific models, the pressure over researchers to produce scientific papers, and the tendency of provide grants only to researchers that get economic results are probably in the kernel of the current bias. According to the William of Occam’s Principle of Parsimony, if you have two explanations to the same phenomenon, choose the simple one. There are several natural processes that can be used to explain the current climatic trend. Natural forcings, like the 11-year solar cycle, El Niño and the Pacific Multi-decadal Oscillation, may be the major cause of the observed climatic variation (Akasofu, 2010). In this case, scientists should use the Occam's razor principle instead of looking for complex, elegant, imprecise, and inconclusive computer models. The world climate is extremely complex, and blaming a single aspect like atmospheric CO2 concentration is not scientific, state the skeptics. Reconsidered II: Physical Science. Chicago, IL: The Heartland Institute.